Mashed cauliflower instead of actual potatoes and get the same creamy comfort without the carbs. Low-Fat Sour Cream - 1 Tbsp. 1) Melt 2 tbsp. butter in bowl. Stir in 1 tbsp. 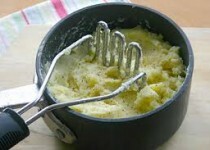 Garlic Mashed Potato Seasoning. Set aside. 2) Steam small head of cauliflower until cooked. Drain liquid. 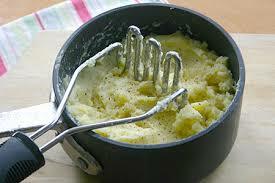 3) Mash cauliflower, adding seasoned butter. Add 1 tbsp. low-fat sour cream. Blend, season to taste.